What is TB #9 using? Alright...at first I thought Thunderbird 9 was taking pictures with his iPhone. Except he kept holding his "phone" right up to his eye. The team was flying...and even after the demonstration...when they were in the recovery stage...TB9 was looking through this. Anyone have a clue??? After the demonstration...he put it in a nice pouch and put it back in the A/V cart. Looks like a signal mirror to me. Why he's using it, I dunno. Were they landing with the setting sun at their backs? He may have been using the signal mirror to spot the planes better...they have a little hole in them you look through. Seems a bit thick for a signal mirror though...but doesn't look like anything else. It's a mirror. No. 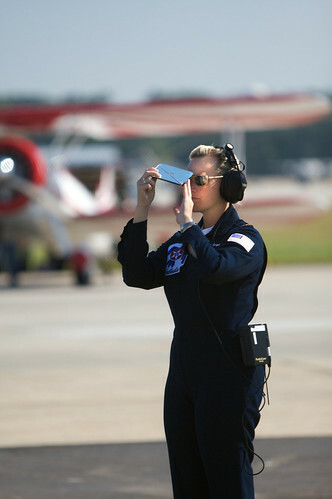 9 is usually the officer using it to provide the pilots (mainly Boss and sometimes the Solos) with a visual cue of show center during the demo for improved accuracy allowing the team to apex the maneuver at the correct place along the crowd line. Sometimes you can even hear Boss on the radio asking for "some shine". Show center is often not co-located with the center of the airport or its runways, so having an additional aid like this helps pinpoint the exact location for the pilots. I saw 9 using the mirror on Friday and 7 was looking through the binoculars; looking for wildlife. I guess there was a hazard on Friday that was a concern as it delayed the show a little. I can't imagine them seeing a small reflection like this. Plus...at Nellis...by the time they fly...the sun is beginning to set in the west. Getting a reflection off that mirror would only work when the team is coming up BEHIND the audience. Any more explanations of this...??? takeone wrote: Any more explanations of this...??? FWIW, my answer is the same as the former No. 9 provided to us a few years back. Believe it or not, but from certain angles it is easier to see a tiny reflection than a big semi, much in the same way it's easier to see a single strobe light at night while flying than the entire airport. These signal mirrors are also used during sporting event flyby's to get the proper alignment for the formstion inbound. Last edited by Lawndart on Sun Nov 21, 2010 1:11 am, edited 1 time in total. Wow...you guys are the experts for sure. Just seemed to me that seeing a reflection on the ground was more difficult than seeing a bus! Is it a rescue item for a downed pilot...like in WWII...they had a small "mirror"...? As a boy scout a long time ago, and far far away, I learned how to make a signal mirror...it is actually very easy to aim a reflection by centering the target (in this case Boss' cockpit), in the hole. As long as the sun is within a 180 degree radius on the same side of the mirror as the target, the reflection will score! takeone wrote: Wow...you guys are the experts for sure. Just seemed to me that seeing a reflection on the ground was more difficult than seeing a bus! Ones like that are about 10 bucks. Just google "signal mirror". The extra hole is for a lanyard. Nothing too fancy. The Blue Angels use the same thing, and a Naval Aviator (or any US military pilot I think) carries one in a survival kit in case of an ejection. Pretty cool how something so simple provides a vital aid to these pilots! The reason it works so well is it's not a pure mirror - it's a retroreflective surface...like license plates, some pavement lines, some road signs, etc. A pure mirror would definitely reflect a stronger flash...but aiming it would be vastly more difficult. You'd have to estimate the incidence angle relative to the sun and whoever you're trying to signal, and then wobble it around hoping that some of the reflection actually gets their attention. With this thing...look through it and in most conditions they'll see you almost as well as a pure mirror...and it's vastly easier to "aim". I can say from flying the Blues demos a "couple" of times in the sim, its definitely nice to know where the comm cart is. Theres a couple of maneuvers (both solo and diamond) that heavily reference this. Does anyone else think it's kind of odd he's wearing sunglasses on a cloudy day? He's MO. He's awesome, he does what he wants! Sorry I'm late to the party - I just noticed this thread. Signal mirrors are my specialty, so I'll try to address any loose ends. Some great photos of the mirrors, here! I provide links to four more "show center" signal mirror photos below - two Thunderbirds, one Blue Angels, and one Snowbirds. As summarized above, Thunderbird 9 is using a glass signal mirror to designate show center, and yes, these mirrors were developed for survival kits. takeone wrote: I can't imagine them seeing a small reflection like this. That "small reflection" can be 20 million candlepower, and seen 43 miles away. Here's video of how the flash from the same model of mirror Rhino's Blue Angel above is using ( 3"x5" glass Mil Std MIL-M-18371E Type II) at 0.7, 11.1, and 43(!) mile range. (the 43 miles was an exceptionally clear day). A reflection off a glass mirror is a lot brighter than most glints you encounter in daily life, because the mirror is much flatter (and more reflective) than car windows, etc., and doesn't disperse the light as much. Think of it not as a mirror, but as a (small) window that you are looking through directly at the sun. Yes, the brightness does depend on the sun angle (8:30-9:30 in video) and the sun-mirror-target angle, but even so - bright! takeone wrote: Plus...at Nellis...by the time they fly...the sun is beginning to set in the west. Getting a reflection off that mirror would only work when the team is coming up BEHIND the audience. The standard rule of thumb is, as long as the included angle between the sun and the target is less than 135 degrees, you are good to go, which means that, if the sun is more than 45 degrees above the horizon, you can flash anywhere you can see. It does look like, in Takeone's top photo, that the angle is getting pretty oblique, though. Since the prior one got cracked, I can see them taking care of this one. It is pretty sophisticated, actually. That eye-shaped aimer in the center is an aiming window with a clear central pupil in the center, surrounded by a fiberglass mesh coated with tiny glass retroreflective beads. When you look through the central pupil in the direction of the column of light reflected by the main mirror, that mesh produces an aiming dot in the direction the beam is going, similar to the aiming dot in a reflex, or "red dot" gunsight. Like the gunsight, the dot is only visible when when you look through the aimer - it is a virtual image, not a real one. The aiming dot looks much different than that in a "red dot" sight - these days it is an extremely bright round fuzzy "fireball" about three times the angular diameter of the sun, and extremely bright. My avatar at left is a photo I took through a mirror aimer - that bright dot is the "fireball" (the sun itself is off to the right, out of view.) I advise wearing sunglasses when using these, and you'll note that the signal mirror user has sunglasses in all three of the photos above, even though the man next to the Blue Angel does not - hint! STRIKER wrote: Does anyone else think it's kind of odd he's wearing sunglasses on a cloudy day? See my note just above. That bright spot is annoyingly bright. Here's the physics of how the aimer works. The mesh is sandwiched in the middle of the mirror, and the retroreflective glass beads return the sunlight that hits them almost directly back to the sun. However, on the way back to the sun, there is a glass-air interface as the light exits the mirror, and a small percentage of the light is reflected off that interface. The geometry of that interface reflection is such that, if the front surface of the mirror and the main reflecting surface are parallel, the light reflecting off the inside of the front surface of the mirror light to the rear of the mirror in a direction antiparallel to the main reflection off the front of the mirror. So your the interface reflection appears to your eye as a virtual image of the sun "floating" in the direction the mirror beam is going. If the retroreflective beads returned the light perfectly back towards the sun, the virtual sun would be the angular diameter of the sun, but they don't, so the fireball is a bit larger. That means you want to sweep the _center_ of the fireball across the target to be sure of hitting it. including the traditional instructions printed on the back of these mirrors. takeone wrote: I wonder what the actual "mirror" is...what it's called and where you would buy one. Thunderbird #9 is using a commercial Vector 1 4"x5" glass signal mirror, which is the largest size survival mirror currently manufactured. Specifically he's holding the Vector 1 "M208 Air Force Type Signal Mirror" (which is NOT actually government issue, but is a fine signal mirror nonetheless, especially the current model (sans metal eyelet)) I haven't found any distributors for that size - I bought mine directly from Vector 1. If you want one, I'd drop Vector 1 an email - the address is on their site at: http://www.signalmirror.com/ and you can see their mirror line if you click on the "Products" link. (a) The edges are painted flat black, per the MilSpec, which gives the mirror a black rim. Military Specification MIL-M-18371E only defines two sizes: the 3"x5" Type II and the 2"x3" Type I, and most recent ones were made by S.I. Howard Glass, who had a minimum order size of 100 last I asked, so a distributor is probably a better idea. The only retailer I found for the 3"x5" MIL-M-18371E mirrors is "The Supply Cache"(formerly FireCache, which sells "S.I. Howard" "MIL-M-18371E" mirrors in both 3"x5" and 2"x3" sizes - I have ordered from them and been happy with the product (no affiliation other than customer). Teel wrote: Ones like that are about 10 bucks. Just google "signal mirror". *** Caution ***: You can easily find 4"x5" glass mirrors online that look just like the one Thunderbird #9 is holding, but if you find one other than direct from Vector I whose aimer actually produces the bright "fireball" against the sky, let me know - I've had no luck, and I have bought (and returned) about half a dozen. Read this consumer alert before buying - it names names. If the mirror isn't labelled Coghlan's, Vector I, Rescue Reflectors, S.I. Howard, or MIL-M-18371E, make sure you can, and are willing to, return it before buying. Last edited by SignalMirror on Sun May 26, 2013 7:54 pm, edited 1 time in total.